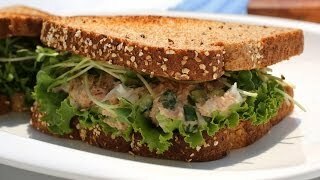 I’m very happy to share my tuna sandwich recipe with you today. I’ve been making this simple but delicious sandwich for years and years, even when I lived in Korea. Western-style sandwiches are popular in Korea for lunchbox items. Every time I made them my friends in Korea wanted to know the recipe, and as you see in the video my friends in LA like them, too! The secret to this sandwich is to use a lot of fresh green vegetables to keep it light and refreshing. Fresh cucumber in particular will keep it cool and crisp, and I just love the smell of it. Many Americans use pickles to the same effect, but I prefer cucumbers. Mayonnaise is not a traditional Korean ingredient but it is used in many ways especially when we make sandwich. We also use it for Korean-style fruit and vegetable salad and potato salad. If you like these recipes, then someday I’ll make a video for them! Happy cooking! Combine the cucumber and onion in a small bowl with the salt. Let it sit for 5 minutes, then put the mixture into a cotton cloth or strong paper towel and squeeze out the excess water. Put it into a mixing bowl when finished. Drain the oil (or water) from the tuna. Put it into a strainer and press out even more, then put it into the mixing bowl with the cucumber and onion. Add the egg, salt, mayonnaise, and ground black pepper. Mix all the ingredients well and make sure the egg gets broken up into small pieces. Toast, grill, or pan-fry 4 pieces of multi-grain bread until the surface of the both sides turns slightly brown and crunchy. Place 2 slices of bread on the cutting board. Add a few leaves of lettuce to each slice of bread. 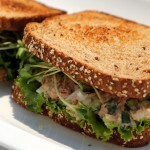 Divide the tuna mixture into 2 and spread it to each slice of bread. Add radish sprouts and a piece of bread to the top. Cut them into halves and serve. Posted on Wednesday, October 16th, 2013 at 2:25 pm. Last updated on October 6, 2014. Posted June 14th, 2014 at 8:42 pm | Log in to reply. Posted October 24th, 2013 at 8:23 pm | Log in to reply. Sometimes I like to throw in some chopped capers or some sweet chopped crunchy pickles (my own) and then other times I flavor it with some curry powder to Add another dimension. I have a feeling that I have backed into a great little website here! Thanks for the recipes. Posted October 20th, 2013 at 4:46 am | Log in to reply. What a bad Korean I am! I’ve been making this sandwich using celery only. Never thought about using chopped cucumbers for that sweet crunchy texture and taste! And you know what, I have all the ingredients to make a couple tomorrow! I also have homegrown tomatoes and sweet peppers to add on top as well. Thank you for this fabulous recipe, Maangchi! I love this video with beautiful outfit of yours. I just bought the coin scarf at th Greek festival and have worn at Oktoberfest too. Now I see you can wear that any time, even on top of pink tutu!! Fantastic!!! Posted October 21st, 2013 at 9:20 am | Log in to reply. Your homegrown tomato sounds very delicious! Posted October 17th, 2013 at 2:19 pm | Log in to reply. Posted October 21st, 2013 at 9:22 am | Log in to reply. haha, you want to add some gochugaru (hot pepper flakes) to your tuna sandwich? Whatever you say, I agree with your idea because that’s what you want. Posted October 17th, 2013 at 1:46 am | Log in to reply. yes, hard boiled egg makes this filling very delicious. This recipe was originally posted on October 16, 2013 at 2:25 pm by Maangchi. It was last updated on October 6, 2014. The video was watched 638,517 times on YouTube & has 9,568 likes!